What if I told you you can now get the best insights from some of the leading experts in the 401k industry – regulators, academic and professionals – all in one, easy to read format? Would you be interested? What if I also told you the material is organized in a way consistent with each separate area of concern a 401k fiduciary might have? Would you be even more interested? Finally, what if I said you could browse under the hood of this special volume at no cost? What would you say to that? And you thought you’d never get something for nothing! 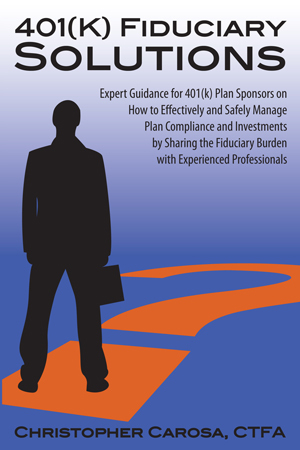 For a limited time, we now giving our newsletter subscribers access to the first 34 pages of 401(k) Fiduciary Solutions. This 300+ page combines some of the best FiduciaryNews.com articles – reordered and edited for better understanding – with more original content to produce a handbook unlike you’ve ever seen. 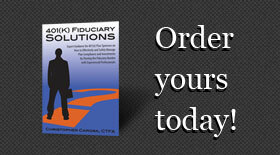 The book cites some of the same experts we interview regularly in FiduciaryNews.com and offers the reader the option of either reader individual self-contained sections or straight through. There’s even new material – checklists – for practitioners and plan sponsors alike to use. But, why say more. Judge for yourself. Here’s a sneak-peek (click here to see it). Interested in buying the book? Then go to the order page right away!